Lately I find myself checking Marc Rubin’s blog frequently hoping for a new essay. Unfortunately he doesn’t post on a daily basis. I’m not even sure who he is, but he’s a terrific writer. His latest post, “Obama’s Seal of Disapproval,” is both funny and thought-provoking. Basically, Rubin suggests that Obama is so far over his head in running for President that he is unconsciously sabatoging himself with his frequent gaffes and flip-flops–that at some level he wants out. I’ve often wondered about this myself, especially when Obama complains about being bored or tired and when he constantly whines about people “attacking” him. It’s almost as if he thinks he’s doing us all a favor and we are just demanding too much. It’s interesting how the mind works. On one level it always wants to tell the truth and sometimes it devises ways to do it on its own even when someone consciously is trying to hide it. That’s why people slip up. Obama’s unveiling of his fake presidential seal seems like the perfect example. Its almost as if its both he and his advisors’ way of getting the truth out about Obama’s and his candidacy.The symbolism of a fake Presidential seal is hard to miss. For our first book club selection, we’ll be discussing Margaret Atwood’s novella, The Penelopiad: The Myth of Odysseus and Penelope. For those of you unfamiliar with the play, King Lear, is a self-absorbed, vain man and a bit of a control freak. He challenges his daughters to a “love test” where they are to flatter him with speeches about their devotion and he tells them he will divide his kingdom according to who loves him best. Goneril and Regan outdo themselves in hyperbole. But Cordelia, Lear’s favorite, simply tells her father the truth and doesn’t embellish. She doesn’t think you can just talk about love but you must demonstrate it. 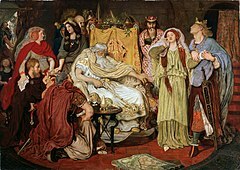 And enraged Lear disowns Cordelia on the spot and divides the kingdom between her two sisters. The rest of the play is full of plot twists and double crossing and lots of pathos and death and eventually sophrosyne when it’s too late. So, anyway, that’s the background for Anglachel’s and Somerby’s commentary. Now, how does it apply to our present situation. Well, Anglachel and Somerby touch on one aspect of the primary season related to the promise to accept public financing but there is another aspect as well and I’ll get to that in a moment. It turns out that last year, several of our fine Democratic candidates took the pledge to accept public financing for the General Election but Hillary did not. Yes, the others prostrated themselves before the press, outdoing each other to prove they were more incorruptable, less lobbyist toe-sucking, more devoted to the purity of the voting public than the other guy. Cordelia, er, Hillary, perhaps knowing how expensive a presidential election could be, just said no. Lear, er, the media, was livid. She was completely diss(own)ed. Well, they would have eventually found a reason to hate, hate, HATE her, but I digress. So, what happened last week? Barack Obama, that paragon of virtue (oh, *please! *), decides to opt out of public financing. He says he never *really* made a promise and a committment to it anyway. He just said he would support the idea of public financing. It’s like “Blessed are the Cheesemakers”, it’s not to be taken literally. Now, the media and the Obamasphere are shocked, SHOCKED that he would renege on his promise. To be fair, there are a certain number of cynical or completely deluded Obamaphiles who will forgive anything he does. But, then, he also backtracked on FISA as well. Someday, I would thunder, Edwards and Obama are going to take it all back. They HAVE to take it all back because in order to win, they can not continue to pander to the purity police on the left. They will have to tack right in order to appeal to conservatives and Republicans and swing voters who they will need to win in November. And no sooner does Obama snag the nomination (or so he thinks) than he immediately backtracks on FISA and sells out our civil liberties. He has to do this to prop up his non-existent national security creds. We would have been better off voting for that toothless Kyl-Lieberman amendment that was all symbolism and did not harm any constitutional amendments in the drafting of its legislation. THAT kinda made sense. Did you or did you not approve of state sponsors of terrorism? Hillary voted that having Iran funding Hezbollah was a not such a cool and groovy thing and we should be on record as opposing it. Where was Barack? Conveeeniently AWOL that day. But Hillary wouldn’t pander. She never courted the Kossacks or the Obamasphere in general. She was roudly booed at the YearlyKos 2007 presidential forum. I know because I was there. It was disgraceful. She was just getting the hang of facing really tough crowds and I could see her physically withdrawing a bit in her chair. “Oooo”, I thought, “She’d better learn to stiffen her spine.” And she did. I never saw a hint of that in her again. Anyway, as time went on, I started to realize that she wasn’t avoiding the blogosphere to snub us, though there might have been some misunderstanding at first as to how important the online cauldron was for message origination and for this I blame Mark Penn. No, what I saw was a person who seem to know where she stood and didn’t feel the need to flatter any particular group. As Wes Clark once said, action follows from principle and that is what I saw in Hillary. She was grounded, she knew her policy landscape and she had a set of guiding principles. She presented them to you and asked her to join her. She didn’t tell sweet little lies that she was going to have to backtrack on later. She was attractive to both left and right and felt no need to pander. That infuriated the blogosphere and they disowned her. How many times have we heard them question whether she was a true Democrat? One of my favorite essays ever is Stanley Cavell’s magnificent work on King Lear, “The Avoidance of Love”. In it, one of his themes was that love, and those virtues that are related to love, such as honor, responsibility, respect, loyalty and honesty, are not things that can be claimed or spoken. They must be demonstrated. They are, to grab some graduate school lingo, performatives, made actual in the doing, and they bear a difficult relationship to language because they are difficult to represent in that way. Declarations of these virtues, most of which either are also political virtues or else have a political correlate, stand in tension with the actions of the one who declares – the act of declaration is an invitation to judge. Cordelia’s love was ordinary, quiet and steady. It did not change to suit the situation, even as she could see the fate that might befall her unless she submitted to her father’s imperious demands. Lear was not the only person in the room passing judgment. As for the play, well, it was a tragedy. I think it needs a rewrite, PUMAs.